Pádraig Harrington showed signs of the never-say-die spirit that made him a three-time major winner when he made a miraculous par in a five-under par 67 to lie just two shots off the lead in the $7m Aberdeen Asset Management Scottish Open. Five-under par after 11 holes and bogey free, he struggled to keep control as late afternoon rain fell on Dundonald Links. But after sandwiching a birdie at the 13th between bogeys at the 12th and 15th, he made what may go down as the par of the season at the 16th before adding a birdie at the 17th to finish the day just two shots behind Finland's Mikko Ilonen. After pulling his drive left into deep jungle at the 16th, Harrington was forced to take a penalty drop but someone got the ball up to within 10 yards of the front of the green. "It looked like I was going to take triple-bogey," Harrington said. "We were really struggling to find the ball, and my provisional was stuck in the bunker. So I would have been hitting my fifth shot from a long way out, and seven would have been a good return. "All of a sudden, I turned it into a four, which, these things happen. When things are going your way, they go your way. Thankfully I was doing well enough that it counted. Making a four instead of a seven, kind of makes my day. "It's a good start. Anything under par, you wanted to get a few under par, this course early on, it doesn't look like a week that it's going to get away from us in terms of scoring. I think it's a golf course that the better you're doing on it, the more intimidating it gets. "If you've got nothing to lose, you can hit driver on every hole and go for it, and there are plenty of birdies to be made in that sense. I think it's one of those weeks, I think maybe 14, 16-under par could be a winning total." As for the 16th, he added: "It was difficult. We got on the tee and it started raining. Modern equipment is built for nice, sunny weather, and certainly, I'm on the limit when it comes to my equipment. So when you get a wet day, you've got a railway down the right, you start to worry a bit. "I pulled it down the left and to be honest, the marshal didn't even know I hit. We were lucky to find it. We were very lucky. Nobody knew where it was. It really was one of those, we were looking in a 40-square yard area probably. It was kind of desperation stakes, so thankfully somebody found it. "It was sitting so badly, I had to take a penalty drop, but I managed to take a reasonable drop and I advanced it up short of the green. "Obviously, I hit a very nice putt, no doubt about it, and I would have taken my five and run to the next tee, but to make a four was a minor miracle." Dundonald is not a traditional links and features severely undulating greens. But Harrington is still happy it will be good preparation for his return to Royal Birkdale. "It's better than no links golf, that's for sure," he said. "It's like 90 percent of the way. I'm sure if we were playing on a traditional links golf course, maybe it would be closer, but it's 90 percent of what you want. You know, that's good enough." Ilonen rediscovered his form in stunning fashion, firing an opening 65 and take a two-shot lead on the back of four missed cuts and with just four sub-70 rounds all season. 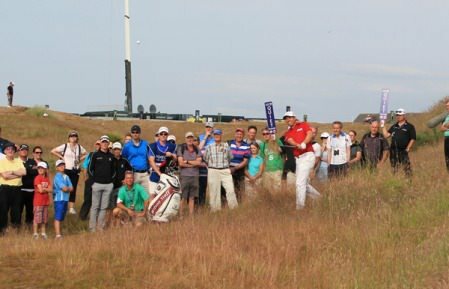 World Number ten and 2015 Scottish Open champion Rickie Fowler of the USA is in a group of six players at five under alongside Harrington, countryman Paul Peterson, the English duo of Ian Poulter and Callum Shinkwin, and Australian Andrew Dodt. The Scottish pair of Stephen Gallacher and Richie Ramsay, Swede Magnus A Carlsson, Greystones' Dunne, Frenchman Benjamin Hebert and America's Matt Kuchar are all one further back at four under with former Masters champion and World Number One Adam Scott among the ten-strong chasing pack on three under. Dunne made five birdies and a bogey in a 68 to share eighth place on four-under and confessed that he's simply trying to finish as high as he can and not thinking about the three exemptions on offer for The Open. "Not really," he said. "I've been asked that a lot. There's only three spots, so you're going to have to do really well. "You're going to have to give yourself a chance to win the tournament to be able to get one of the Open spots, and if you have a chance to win, the last thing you're thinking about is The Open. You're going to try and win. "It would be a bonus if you did well, but only Thursday and lots of golf left. I'll stick to my guns and try to play as well as he can." McIlroy got off to a terrible start with bogeys at the 11th and 12th and a double bogey six at the 14th, leaving him on four over. Struggling with his wedge play, he then birdied the par-five 15th but took four to get down from close to the green and bogeyed the par-five 18th to turn in 40 — his worst nine of the season. A pair of two-putt birdies at the third and fifth followed by another birdie from 25 feet at the seventh got him back to one over. But he bunkered a wedge short of the ninth and missed a 10 footer for par to post a two-over 74 to share 103rd, leaving without a word to the waiting press. Graeme McDowell's hopes of qualifying for The Open suffered a killer blow as he made three birdies, four bogeys and a double bogey in a three over 75. As for Darren Clarke, his horrific run of form continued when he bogeyed the 15th and then double bogeyed his last three holes to prop up the field after an 80. “A 65 is the round of the season for me, really. It's nice to get something going, make a few birdies and no mistakes on the card. “I actually changed my irons on Tuesday to Titleist 718s. It can be just little things like which that give you a little extra confidence. I didn't really miss one shot - well, one tee shot I missed on the eighth - but other than that, I struck the ball better than I have in probably the last two or three years. “Well, it's a long way to go, it's Thursday, isn't it? You've got to take advantage of what you get. When you have those chances, you've got to make some birdies. I missed a couple of short-ish birdie chances in the beginning, and luckily I didn't get frustrated there because there were plenty more holes to come. So, it was just a matter of staying patient. “It’s fun to go out on links and, for me, to hit shots that don't necessarily have to be spot on. It's kind of about managing the game, hitting shots, working your way around the golf course, putting yourself in the right position and avoiding bunkers. “I felt like I did a good job of hitting fairways today, staying on the right side of the hole, and I made a couple of birdies. Thursday is all about getting off to a good start and I did a great job of that. I felt like I made a couple of good putts for par to keep the round going. Just a clean card is always a good thing. “I’m pretty happy. The last couple of days, I don't feel like I've hit it all that well, so I spent a bit of time yesterday on the range with Pete. “I got myself in a couple of spots of bother, but pretty much swung it well, put it in position and made a few putts, and that adds up to a nice score. “As good as the round was today, I'm still going to hit the range. I'm still not 100 per cent happy, and it's a work-in-progress. So I'll keep working towards the ultimate goal. “The last few months have been weird, planning a schedule pretty much in the States, and then obviously a big finish in The Players changes that instantly. So from a miserable-looking summer – I’m not saying it's miserable playing over there, but it was miserable to be away from obviously Katie and the kids - that turned on its head pretty quickly with one decent finish. “I played okay through the first 12 holes, or certainly early on, and made the most of it. You know, whatever opportunity came my way, I kind of took it early on and I holed a good putt on the first, which, in these conditions, you're always happy if you can get under par early on. I moved forward from that. Then I struggled a lot over the last couple of holes in the rain. I kind of panicked coming home but my short game saved me the last couple holes and I have to say the four on 16 was a minor miracle. "I'm off to a good start and I’m delighted with that. It was one of those days that you had to use the head and if you hit it in the rough, you had to play away from pins. "It’s a second-shot golf course I would say. Obviously, if you're coming from the fairway and hitting good irons, you can score well. But if you're coming from the rough, you've got to play safe, play away from the flags and two-putt to try to get on to the next hole. So it's a good mix of holes here. You've got long par fives, a bunch you can reach, short par fours and long par threes. It's a tough track today with a crosswind straight across the course.